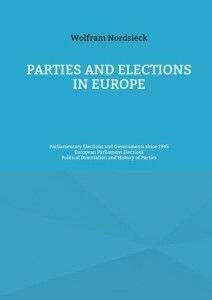 Parties and Elections in Europe provides a comprehensive database about political parties, elections and governments. The website contains the results of legislative elections from more than 100 countries and regions in Europe. The parties are classified according to their political orientation. Historical data can be found in the archive. Contact information: Wolfram Nordsieck, Merkurstraße 1, 40223 Düsseldorf (Germany). Email: info[at]parties-and-elections.eu. News, suggestions and corrections are always welcome.